So as promised I’ll tell you about the Crooked Swede. Lainie and I went up to Manitoulin Island to visit friends, Marilyn and Elwood. They have an amazing backyard garden that was a little overrun as Elwood had been away for a week at his bother’s 80th? birthday party in Saskatchewan. 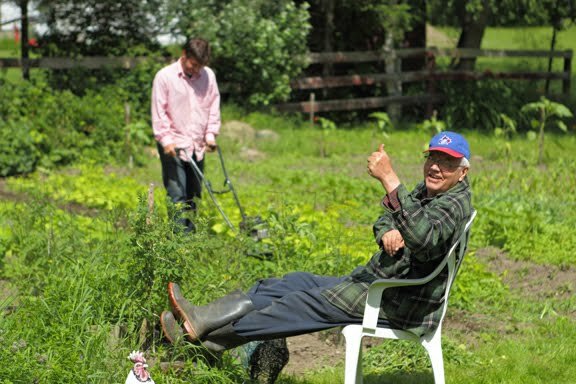 As we helped him catch up on the garden, he told us about his potatoes he calls Crooked Swedes. Where exactly the varietal originated is unclear but the ancestors to these little beauties came over from Europe in the coat pockets of Elwood’s grandfather in 1905. Elwood gave me a few of the sprouting spuds and i have planted them in the Niagara. Not sure if they will be too late to give me a few spuds or not. I hope to get enough to use for seed next year. If not I guess we will have to head back to the Manitoulin for some more gardening and spuds next spring. Thanks Elwood and Marilyn for the great day and for the Crooked Swedes.